Here we are, as promised, our first Craptacular Crafts segment! Eh, I'll work on the title. 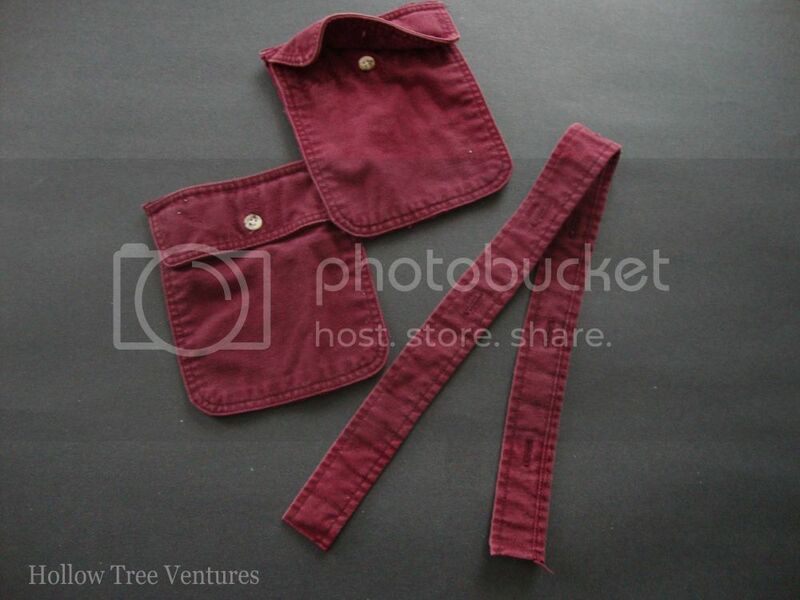 In the meantime, if you missed this post when it was originally published on my craft blog (that's everyone but you, Mom), get ready to repurpose those old shirts your husband refuses to get rid of, even though they have holes in the sleeves and ring around the collar. My daughter wanted me to make a purse for her birthday, but I wasn't sure if I'd have time. I was cutting up a flannel shirt for another project, and got the idea to make a purse from the leftover parts! It was so simple, and incredibly fast. 1. Cut the row of buttonholes off the front of the shirt, from the bottom to the collar. Then cut the pockets off the front of the shirt - just cut around the edges as close as you can without snipping into the pocket. 2. Sew opposite ends of the buttonhole strip to the top left edges of the pockets (see photo). Make sure that the buttonhole strip (which of course becomes the purse strap) won't be twisted up when the pockets are back-to-back. I used a zig-zag stitch for extra strength. Note: I used contrasting thread for a fun look, and since the stitching shows I sewed all the way across the top of each pocket flap so it would look symmetrical. If you use thread that matches your fabric, you'd only need to sew where the strap meets the pockets. 3. Place the pockets back-to-back and sew around the left, bottom and right sides, being careful not to sew the pocket flaps closed. Embellish as desired. That's it! Now you have a purse with three pockets (the pockets themselves, plus the space in between the backs of them). Plenty of room for a little girl's treasures! 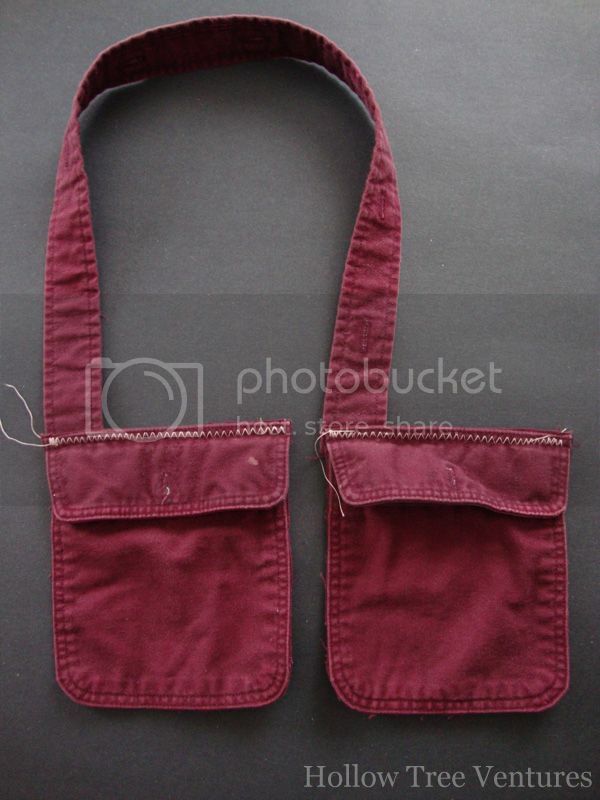 I used a man's shirt, but if you can find a woman's shirt with two pockets you could make a more delicate purse for a different look, since the pockets are usually smaller and a lighter fabric. With the right fabrics and embellishments, it would even make a great gift for a teen! 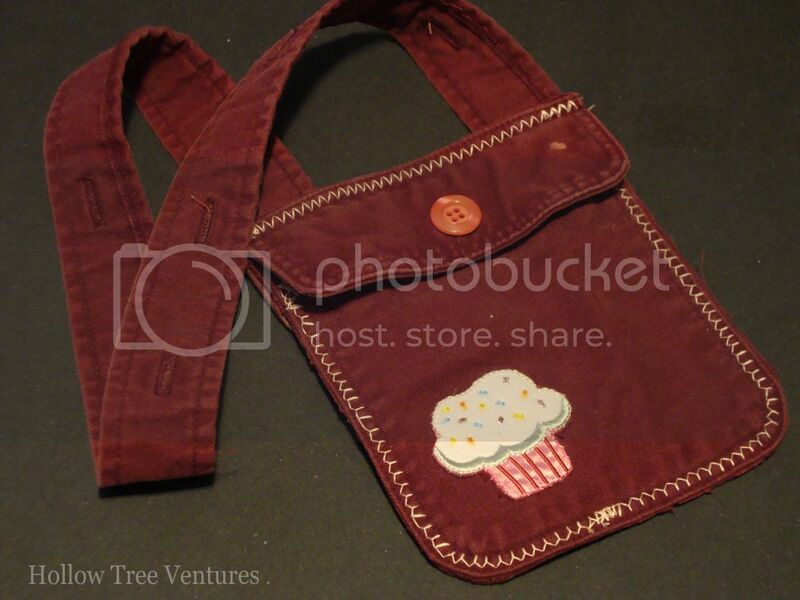 You can personalize this purse in so many ways - try hooking a key ring through a buttonhole and adding a charm. You can mix and match pockets and straps from different shirts. You could weave fabric through the buttonholes to decorate the strap. On my daughter's, I added iron-on appliques, tied a bow through one of the buttonholes with a scrap of fabric, and changed out the pockets' buttons for something more colorful. She loved it! Super cute, Robyn!! Makes me wish I had a little girl. I am pinning this anyway - it's too cute not to share. You're the sweetest - thanks so much! That is REALLY cute Robyn! Fabulous idea! Thank you! I wish all the old scraps of junk I have lying around would end up being so useful. Absolutely adorable--but I'e clean run out of little girls and my husband refuses to carry a purse!! Are you turning all Martha Stewart on us now? I have a giant box of unused pinecones and some silver spray paint siting in my basement just begging to be made into a wreath. I will send them your way. 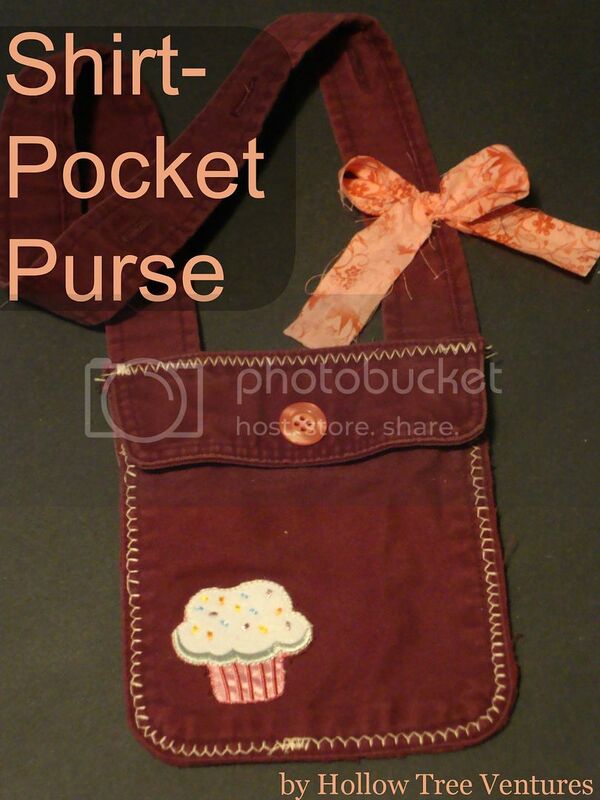 You can thank me by making me a pocket purse, which I will then sell on esty for a handsome profit. Great idea. 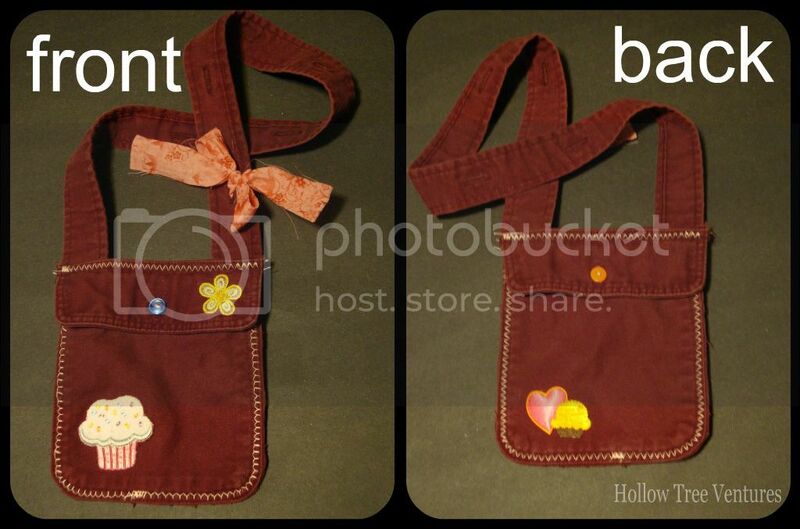 I might make one for my little bag-loving princess. Just the thought of it makes me smile. :) Love your face, lady! So Cute! When I was little, I remember my sister always being buried in such projects! Such a nice project! Haha Craptacular Crafts! I did something similar: Ghetto Crafting (made homemade memory cards with my kid). I've had my fair share of tech-splosions, too - best of luck, for real! And ghettto crafting is too. Dang. Funny. Any time we can get kids involved with low budget, low quality crafting, eh?